FREQUENTLY ASKED QUESTIONS (FAQs) for WhenInManila.com about being a contributor, advertising, media partnerships, writing and more. What awards have WhenInManila.com won? How can I be a contributor for WhenInManila.com? / What are the requirements to be a contributor? Can I send videos to be featured on WhenInManila.com? Do contributors have to live in or write only about the Philippines? Why should I contribute to WhenInManila.com? What’s in it for me? Do you pay contributors / writers? Do you have to contribute or write regularly to be part of your site or community? Do you republish articles?/ If my article has already been published somewhere else, can you re-post it? Do you take interns or have any internships available? Do you do sponsorships or media partnerships to promote upcoming events? What is the time-frame needed for media partnerships? How can I follow up a Media Parthership? Other media partnership details & questions? Where can I get your logo for our event posters and flyers for our media partnership? Do we have to sign a contract or Memorandum of Agreement (MOA) for media partnerships? After reviewing all instructions above and following WhenInManila.com’s guidelines, I still do not see our event featured. How can I follow up? What do I do if I want to promote my restaurant / event / brand / widget on your site? How much does it cost to get featured? What if I want lots of features where you use your SEO techniques and banner ads to really get my brand out there and help bring me lots of great online marketing? What brands have you worked with before? What if I want to send you samples of our products (clothes/shoes/pastries/sweets/make-up/anything) for you to review and write about? Do you post press releases? Do you have a list of your team members / authors / writers / contributors? I wish you would post more “positive” articles / Why did you publish that one article I don’t agree with? Don’t you have anything better to write about? Why do you post Clickbait? Why do you have misleading headlines? Why do you blog about places not in Manila? Aren’t you guys called “When In Manila”??? Can you please stop sending me notifications on Facebook? I commented on one of your articles on your FB page (http://Facebook.com/wheninmanila) and now your page won’t stop sending me updates on Facebook; how do I stop or opt out from that? Where do you announce your contest winners? I don’t see who won your contest? What is WhenInManila.com? / What awards have WhenInManila.com won? WIM is the top online magazine in Manila and the Philippines. We are a community of writers, photographers, videographers, artists, storytellers and travel junkies who share our fun experiences through our various social media accounts. We accept writing contributors, photography contributors, video contributors and other ways to just share stories. Just send an email to our editors, Angeline Rodriguez and Nicole Villaluz, at contribute.wheninmanila@­gmail.com. Send a sample of your writing, via a link to your personal blog or via an attachment. Angeline and Nicole are a bit busy with the gazillion features they take care of daily, so just in case we don’t get back to you, kindly just follow up so we can make sure to get you the info you need. Can I send in videos to be featured on WheninManila.com? Yes, we accept video submissions. Just send an email to video.wheninmanila@­gmail.com with the name, social media channel, or link that you want the video to be credited to. Please take note that we will be adding our logo to your videos and might edit them a little bit to fit our style better. Absolutely anyone from anywhere in the world can try out to be a contributor. We have contributors from the Philippines, Hong Kong, Singapore, Thailand, the United States, Canada, New Zealand, Australia, South America and all over the world. Most of our stories are about Manila and the Philippines, but we do accept and have occasional contributors who shares stories from their countries as well. Some of our contributors just love writing and are looking for an outlet to share their stories. Imagine spending hours writing an article, only to find that just two people have ready it (you and your mom). Again, we get MILLIONS readers per day, plus we also promote your article on our social media accounts, which also have their own millions of followers, fans and readers. Our writers enjoy invites to the most expensive restaurants, where they get to bring their whole family or group of friends and treat them to a free meal, all in exchange for a review. Our other senior writers also get free phones, clothes, gadgets, bags, accessories, shoes, and more. All in exchange for a review of the brand / product. Our writers get invites and VIP access to the biggest and most exclusive events. From front row access to concerts, sporting games, clubs, bars and other top events, our writers usually get the red carpet treatment. We get invites to grand openings of the most prestigious brands and restaurants, VIP tables to the biggest clubs, media passes to the hottest music concerts and invites to press conferences with the top stars. We train each of our writers in the most professional and up-to-date ways to increase readership to their own blogs. We train them to be pro-bloggers and how to write better. We also teach many Search Engine Optimization (SEO) tactics that will ensure more readers to their blogs. Our writers have gone on to get top positions at top global and local firms in many different industries like advertising, journalism, marketing, business, writing and more! The experience of writing for a top online magazine and digital brand is one that can translate to a better job for you with top companies. You get to meet amazing, driven and interesting people as you feature new events, restaurants, concerts and more. You’ll meet young entrepreneurs starting out new businesses as well as seasoned veterans willing to show you a thing or two about what they do. But other than just meeting people through interviews on your features, you’ll also be part of our community and meet other writers, photographers, travel junkies and adventure seekers like you. 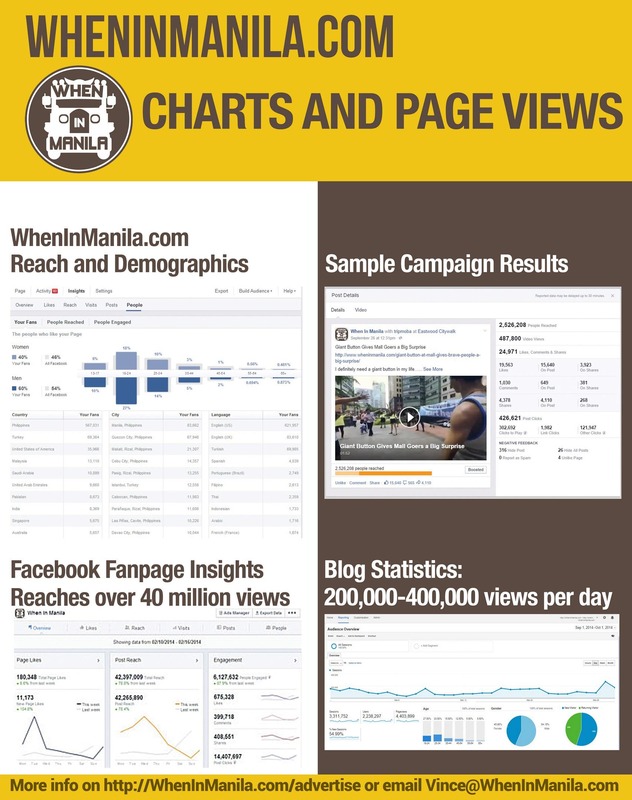 You’ll also gain access to a huge interconnected network that we at WhenInManila.com share throughout our thousands of features in and around Manila. Taking your entire family out to a free dinner at the most elegant and expensive Italian restaurant in town. Getting an overnight stay at the best 5-star hotel. Getting a free trip to Davao Getting a flight and accommodations in Hong Kong. Front row seats to concerts. Back stage passes to events. Exclusive invites to the biggest and newest venues. Tables and bottles at the high end clubs. VIP treatments. A free phone. A free dress. A free designer handbag. Free shoes. Meet celebrities. Meet young entrepreneurs. See the world! …. The list goes on! It just more fun to write for WhenInManila.com! Most of our writers write because of the love for writing or wanting to share a story. Our writers get to keep the product they review or they get free travel, accommodation or pocket money at times. Other than that, the perks of writing for us include lots of freebies. From free meals, to free flights, free hotel accommodations, free clothes, free gadgets and more. Our writers are usually able to keep the items they review (depending on agreement with client). 99% of our features are written without any compensation from any brands or products. So most of our features do not have any direct payment. We do have advance sales and referral programs for Senior Writers. Moreover, we only hire from within, so our administrators, editors and managers all started out as contributors for our site. You only have to contribute as often as you want. You make your own schedule. We have writers who write once a week, but also have writers who only have time for features once a month, or even less. You write at your own pace and schedule. Of course, once you accept an assignment and volunteer for it, that’s the only time that we hold you accountable for a deadline. But again, this is by voluntary basis. So you can choose when to accept features that fit into your schedule. Do you republish articles? / If my article has already been published somewhere else, can you re-post it? For articles already published elsewhere online, we cannot republish it exactly as is. Google actually sees sites with duplicate content and rates both of them lower. So if we republish an article from your own personal blog, Google would rank both our sites lower. Articles published in print (magazines, newspapers) but not published online, may be considered. Although most of the time, print publications will also publish their stuff online. Yes we do! We accept interns on the months of January, May, and September! Whether you are a student or not, we also always take contributors and it really benefits students and young professionals. There are lots of perks to contributing to our site and in some ways, it has many similarities to our internships. As a contributor, we train you on how to write professionally, you get lots of freebies, you gain vital experience for your resume and lots of other perks as mentioned in the other sections of this FAQs page. Best of all, you get your work seen by our 10 million readers per day! This helps to build your personal brand and professional resume. Moreover, we only hire from within. So many of our contributors eventually move up and get hired by us as freelancers or with permanent positions. Other info on contributing in the other sections of this FAQs page. We are! But….. we mostly hire from within. We usually choose to only hire contributors or interns who are already familiar with our culture and our site. We have some longtime contributors or past interns, who have been with us and eventually gained a great permanent position with us. Plus, there are the new contributors who immediately make a great impression and positive impact, so we hire them right off the bat. More info on contributing in the other sections of this FAQs page. Sponsorships or media partnerships to promote upcoming events? How can I follow up a Media Partnership request? Other Media Partnership questions. We do media partnerships and/or sponsorships to help promote your event! For WhenInManila.com, we can be a media partner and post your press release and your flyer / poster on our social media outlets to help promote your event. In exchange, we only ask that you kindly acknowledge “WhenInManila.com” as a media partner and provide us with all media partner privileges including having our logo on your flyers and media, acknowledging us at the events and other media partner benefits. RE-EMPHASIZING to please always refer to us, or mention us as “WHENINMANILA.COM” with the full URL that way for all your patrons to know that we are a website. Will will respond with confirmation of our partnership. We will try our best to feature your event within 7 working days of you sending the material. Joanne is a bit busy with a gazillion features and partnerships she takes care of daily, so just in case we don’t get back to you, kindly just follow up so we can see about featuring your event / brand. FOLLOWING UP: We will try our best to feature your event within 7 working days of you sending the material. We appreciate your patience in this matter. Of course, if we need to rush the posting, we do have sponsorship packages available so we can better prioritize your posts. *Timeline: Your event must be at least two (2) weeks away as we need time to finalize, review content and publish the articles. We usually cannot rush media partnerships unless you are willing to pay a rush fee. We also cannot be a media partner if the posters and marketing materials have already been printed as part of our agreement to do this is to be included in the marketing materials. **Restriction: One restriction of ours is that if you have other media partners, they should all also be prominent media outlets and reputable sites as well. We do not require exclusivity but we choose to only be associated and co-media partners with prominent publications who are in line with our own standards and ideals. 1. Please send all emails to partner.wheninmanila@­gmail.com as they are the ones who handle media partnerships. 3. Following up: we get hundreds of emails daily and will try our best to prioritize your email, especially as a media partner for your event. Please note that as stated above, it is preferred to have 2 weeks time to properly draft, post, edit, prepare and publish features. We appreciate your passion for your event, but hope you can also be patient. Please follow up after giving us a few days to properly read emails and publish. 4. For rush events, or if you would like us to prioritize your features, we have sponsorship packages available upon request. For most events, we do not sign contracts or memorandum of agreements since there are no monetary values, sponsorships or money being exchanged. Just follow the guidelines mentioned above and email them to us for confirmation. More info on Media Partnerships listed on this page. We appreciate your patience in this matter. Of course, if we need to rush the posting, we do have sponsorship packages available so we can better prioritize your posts. What do I do if I want to promote my restaurant / product / brand / widget on your site? You can email our Community Manager: Sky Gavin at sky.wheninmanila@­gmail.com, who will guide you in this possible feature. Sky will get back to you soon if we can find an available writer and photographer to join your event or feature your products / services / brands. Please note that we’ll do our best to try to feature this, but really can’t guarantee an article due to the high volume of feature requests (we literally get hundreds of requests per day). We’re not able to allocate resources to all feature requests we get, but we can better prioritize your brand or events if we can work out some sort of mutually beneficial partnership or sponsorship. There are many benefits to long term partnerships like continued social media promotions on a regular basis, and the targeting of multiple keywords. Moreover, having lots of articles about you that may appear on Google searches is a big plus. Our past clients really saw an upswing in brand recognition when we blog about them on a monthly basis. But, if you are not able to allocate a budget, let us know and we could possibly do something on a smaller scale, like a one time post. Just email sky.wheninmanila@­gmail.com and let her know if you are interested in bigger partnerships. We’ve worked with small, local mom-and-pop-shops all the way to giant international brands. For the bigger brands, we’ve worked with Smart, Sun, Acer, PLDT, Megaword, Unilever, P&G, Nike, Starbucks, Yahoo, YouTube, Adidas, BPI, Jollibee, Globe, SM, McDonalds, Meralco, Sony, Acer, Asus, KFC, Coca Cola, Kia, Visa, Mastercard, Metrobank, Gold’s Gym, Green Cross, Marie France, Facial Care Center, Spinner, Star Mobile, Union Bank, Baskin Robbins, TGIFridays Restaurant Group, Lenovo, Johnnie Walker, Sofitel Hotel, Cebu Pacific and so much more. Best to email us first so we can better see what is needed to properly promote your brand. Email our Community Manager Sky Gavin: sky.wheninmanila@­gmail.com for potential product features. We try not to feature too many press releases or advertorials on our site to keep our content authentic and in order to maintain the high quality and credibility of our site. Email our Community Manager Sky Gavin: sky.wheninmanila@­gmail.com for potential features so that we may possibly see how we can best work with you for features or partnerships. ABSOLUTELY! We’ve had many success stories! Finally, for posts on helping people out, as much as we try to help everyone who might need it, we get hundreds of requests regularly asking for help to promote a fundraiser, a charity, a sick individual, a dying animal or many other people, places or things that need help. We will do our best to help and share each one but please note that it is very difficult as well as we need to verify each one and also make sure that all the info is correct and that it is not a scam. This really takes a lot of time and effort and we are really not able to do it for the hundreds of requests we get. If you really need to help someone and you can send the full story, with all the info, and have proof to verify the story and people are in genuine need of help, please send all of that over and we can consider it. It makes the request a bit easier and faster if it is already proven to not be a scam, and if all the info and story is already ready to be posted. Actually, 90%-99% of our articles are positive. We write about the great food finds we taste, we share that little hole in the wall to let you know about how cool it is, we share stories about inspiring people, we spread stories about events that uplift us, we post about things that motivate us, we feature events, places, people, food, blogs and things that we feel are great for Manila, the Philippines and the world. Once in a while, we do have more controversial articles or features about certain “negative” events where we write about it to warn others, or to foster dialogue and communication within our readers. There are times that these more controversial articles tend to get a lot of traction online. Please know that our intentions are always to share knowledge and to inform. We do not intend to spread negativity. It is out of our hands if most of our readers choose to share the controversial story, rather than our cool new restaurant review. So if an article does go viral that you do not feel should be shared, simply don’t, and then head back to our site and find one of the many more articles we many have that is more positive, and share that. A few (around 20) samples of positive articles are in the links on the text for this answer. Thank you so much for this concern. We can tell you that to a certain extent, EVERYTHING posted online or in media wants your attention. All our articles do want you to get intrigued and come read the full story on our site. On the other hand, the extreme negative version of “clickbait” is posting something completely untrue or completely different from the article or destination, in hopes of “baiting” you to sites, which would then either sell you something or possibly even install some malware on your computer. We can assure you that we never craft articles or titles in a misleading way just to get you to come to our site. Although we do try to find the interesting angle or the “drama” to a story at times, we will never intentionally mislead or misconstrue a story or headline, just to get you to click on it. Although many of our articles are centered around and about Manila, most of our readers and people from Manila also like hearing about other places they can travel to, other global news bits, and international trending articles. We feel it irrational to say we cannot write about our trip to Japan, our visit to Cebu, our discoveries in New Zealand or our adventures in Davao, especially when most people from Manila also travel and would also want to hear about these wonderful stories. Similar to asking the New York Times to only write about New York, or the Manila Bulletin to only write about Manila, we don’t think it would be wise to do that. We firmly believe in being a global citizen. We believe that Manila is part of a bigger world. We do not directly send you anything on Facebook. For that matter, we cannot send anyone any notifications or updates directly on Facebook. We also did not “tag” you on anything nor can we ever do that. We also do not “put” anything on your page nor can we remove anything from your personal page. What you are getting are most likely Facebook functions, updates or notifications. We assume it may be notifications from thread where you commented on our page. Updates or notifications you are getting are Facebook functions and we have nothing to do with that. There are options you can click on like the “Stop Notifications” button from that specific thread that will stop notifications. It would be best to read through Facebook’s guidelines and help pages as we are not sure what specific notifications you are getting. What we can assure you is that we do not send you any updates of Facebook notifications even if we wanted to as Facebook does not have those options for us. We usually announce contest winners on the contest post itself. Most of the time this will be on our website, on the actual article with the contest guidelines. Sometimes, we run contests solely on social media outlets like Facebook, Twitter or Instagram, and in those cases, we announce the winners there on the post itself. Sometimes, winner announcements are late, but rest assured that all contests have winners and all contests are legit. Moreover, rest assured that we always announce the winners.